When I was a kid, my mother made meatloaf a lot. My mother especially liked adding this season packet to it. I hated when she did that. As a kid, I liked the plain old ground beef, oatmeal, egg, and ketchup. As an adult, I want something with more flavor. But probably not as much onions as my grandmother puts in her meatloaf recipe. My sister wasn’t a huge fan of meatloaf. 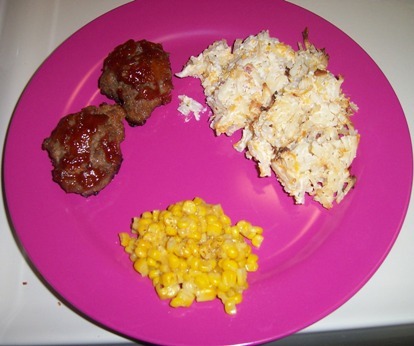 But as an adult, I remember her saying that she had found a mini-meatloaf or meatball recipe she liked. It looks like I must have printed this mini-meatloaf recipe off from a Betty Crocker email. I liked the smooth consistency of using Bisquick instead of oatmeal. I also thought the sausage wasn’t over powering. BBQ sauce was the perfect mix of sweetness. Hope it spices up a classic from your childhood. Heat oven to 450 degrees. In a large bowl, combine brown sugar and ketchup. Reserve 1/4 c. for topping. Add to bowl remaining ingredients and mix well. Spray a 13 x 9 pan with cooking spray. Place meat into pan and make a 12 x 4 rectangle. Split down the center with a spatula, crosswise split into six equal sections. Separate into 12 mini-loaves and make sure they aren’t touching. Brush with remaining ketchup mixture. Bake 18-20 minutes. Makes six (two piece) servings. Nutritional Information (per serving): 300 calories (140 calories from fat), 16 g. fat (6 g. saturated fat, 1 g. trans fat), 105 mg. cholesterol, 440 mg. sodium, 17 g. carbs, 0 g. fiber, 11 g. sugars, 22 g. protein.